This has been the case for me as well. When I page through a document, the pages display as blank, until I click in a text frame. So if I go through a document spread by spread, I have to click in each text frame, on each page, to see the contents. @Laura: What is your version of InDesign? Sometimes the CC app says you're updated, but you might still be at an earlier version if you're running an older operating system. This feature was rolled out in version 14.0. Once you are at version 14.0, it should be just another panel, available under Window > PDF Comments. Yes, PDFs that were made from a previous version of InDesign cannot have their comments imported into the PDF Comments panel in InDesign. A workaround is to export the comments from the older PDF to a data file, make a new PDF in the new version of InDesign, transfer the comments into it (in Acrobat, export comments to data file. 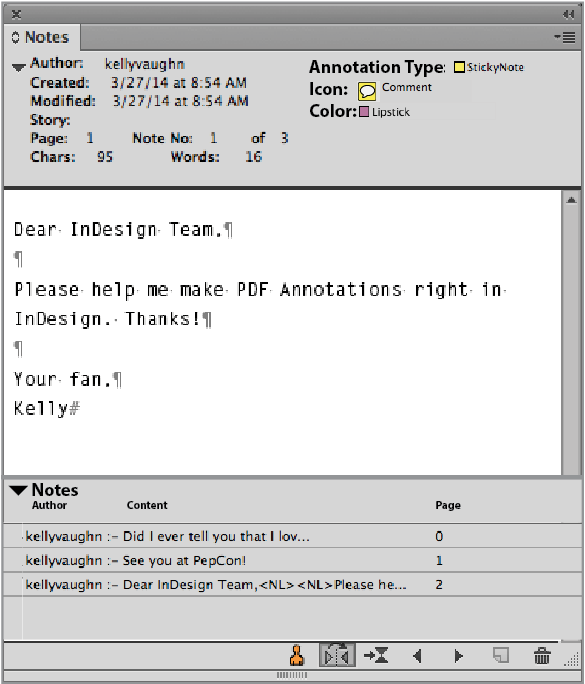 Then you can import the comments into InDesign. Also, as this feature does not allow you to select a page range, it will not work with books. Because you have no way to select a page range of the PDF when you import it. I suppose if you really needed to, you could manually break apart your PDF and save out a bunch of different files which you could then import into InDesign. Hello Abhinav, I don't use inCopy because from a publishing standpoint, I have a 1-person workflow. I create technical documentation for manufacturing companies. Once the draft is done, I send it as a PDF to my clients. They work for a different company, in a different office, and even in a different industry. I use publishing software on a day-to-day basis, but they do not. I sit squarely in the publishing industry (and my work crosses over into other industries), but my clients sit squarely in engineering and construction, working with AutoCad and 3D modeling software every day. I cannot ask them to purchase and attempt to use InCopy in order to do something they can already do using the free Adobe Reader. As far as the InDesign/InCopy workflow, that's great for people who work with editors in the publishing industry. But PDF commenting (Specifically text correction markups), are used by people across all industries. By limiting this feature to only InCopy, that essentially excludes anyone outside of the traditional publishing workflow from using it. This was addressed in item #2 in the original feature request. Yes to everything that Lindsey Thomas Martin said! Especially #3! I would also like workflow #2. But regarding accepting or rejecting the comment... that doesn't always fit my workflow. I send a draft (filled with technical questions) to the reviewers. If I choose to accept or reject their comments, what happens? If the InDesign text flow isn't actually changed (and I'm hoping it wouldn't be changed, since they are not editors), what happens? Do I get a green check mark? Hopefully the comments won't disappear, but will remain in the document as comments, maybe simply with a different status. I would like the comments to remain inline (like Notes), so they when the text reflows, the comment will stay with they text to which they pertain. I would really like to be able to use tools like Acrobat's drawing tools to make comments in my InDesign file. If I have a question about a whole block of text, here is what I currently have to do. 1. Make a note in InDesign, describing the part of the text in question. 2. Then I export my PDF with the PDFStickies plugin (which converts InDesign Notes to PDF annotations). 3. Then using the Acrobat drawing tools, I draw a big box around the text that I have a question about. 4. Then I choose Open pop-up note and cut and paste the text from my original PDF sticky note in to the pop-up note in the rectangle I just made. It's a real pain, but since InDesign and Acrobat commenting/noted features aren't synced, this is the only way I can accurately draw attention to certain portion of text in my document. It would be great if I could convert InDesign objects to PDF annotations; similar to the way we can convert InDesign objects to buttons, which then export to Acrobat as functional buttons. Import font attributes of text used in PDF comments such as underscore, bold, italic, etc. Seriously. There is so much wasted space! It seems to me like Adobe tried to match the comment UI of Acrobat DC. Which is horrible. This panel should be made to match the rest of InDesign. I suspect that's happening because the graphic is anchored in a paragraph that is referenced in the TOC styles. I wrote about that here: https://indesignsecrets.com/how-to-incorporate-chapter-thumbnail-images-into-an-auto-generating-table-of-contents.php If you put that graphic either unanchored, or anchored into it's own paragraph using a type that's not referenced in the TOC styles, that should fix the problem.